When you come to the Historic Biltmore Village in Asheville, NC you will find the Village Wayside Bar & Grille, located in the old passenger train depot. 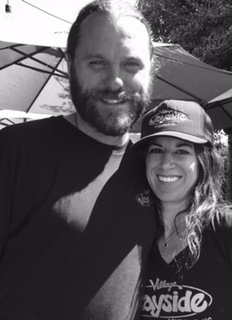 We are Mark & Polly Harding, the Slightly Dysfunctional People Pleasing husband & wife team who opened the Village Wayside Bar & Grille. Our lives in the service industry started long before we decided to open the restaurant; from childhood days of peeling potatoes & piping éclairs, to perfecting a good sales pitch in our college years. We moved to Asheville in 2001 after coming here for a long weekend to see music & instantly fell in love with this area & today happily call it home. After marrying in 2006, our dreams of opening our own place began to come into focus. With a lifetime of combined experience, we had specific goals & a plan in mind. Location! Location! Location! A long work history at both LaPaz, a former Village staple, & the Biltmore Estate meant we didn’t have to look far to find the perfect place: the old train depot! It took a little love & a lot of elbow grease to open our doors in June of 2009. Village Wayside is located in the heart of Biltmore Village & has become a favorite for tourists & locals alike. Our priority is to provide delicious, honest, homemade food & excellent customer service in a clean environment, consistently! One of our favorite things about owning our own restaurant is the personal interactions we get to have with our guests on a daily basis. We are proud to incorporate family recipes from our Midwestern & Texan upbringings. When in the Asheville area, stop in & taste one of our house specialties: Potsy’s Piggies, Smoked Brisket, & Big Mama’s Coconut Cream Pie! We have inherited the gift of hospitality & it is our pleasure to serve you!